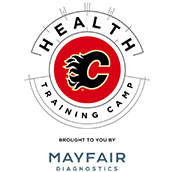 The Calgary Flames and the Calgary Flames Foundation will host the fifth annual Flames Health Training Camp brought to you by Mayfair Diagnostics. People over the age of 18 are invited to the two shopping centres for free health assessments. Following the assessment all attendees will have the opportunity to meet one-on-one with physicians and exercise specialists on individual needs. Reserve your free health assessment at the location closest to you!